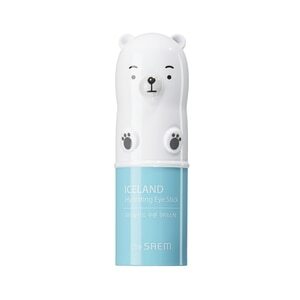 This cooling eye stick delivers refreshing instant hydration of pure mineral water from Iceland. It diminishes the look of dark circles, puffiness, and fine lines. It comes in an adorable travel-size package and can be worn under or over make-up. Ingredients: Water, Butylene Glycol, Alcohol, Sodium Stearate, Sodium palmitate, PEG-12 Dimethicone, Xylitol, Glycerin, Niacinamide, PEG-8, Bis-PEG-18 Methyl Ether Dimethyl Silane, Sodium Citrate, Dimethicone, Potassium Alginate, Methyl Methacrylate Crosspolymer, Phenoxyethanol, Xanthan Gum, Fragrance, Citric Acid, Laminaria Japonica Extract, Cetraria Islandica Extract , Mesembryanthemum Crystallinum Extract, Adenosine, 1,2-Hexanediol, Zingiber Officinale (Ginger) Root Extract, Eugenia Caryophyllus (Clove) Flower Extract, Polygonum Cuspidatum Root Extract, Zanthoxylum Piperitum Fruit Extract, Polyglutamic Acid, Glycolic Acid, Arginine, Carnosine, Glutathione, Acetyl Cysteine, Ascorbic Acid, sh-Octapeptide-4. Swipe under eyes at the last step of your skincare routine. You can use on top of makeup whenever you need de-puffing or extra hydration.